Product prices and availability are accurate as of 2019-04-23 13:29:24 UTC and are subject to change. Any price and availability information displayed on http://www.amazon.com/ at the time of purchase will apply to the purchase of this product. 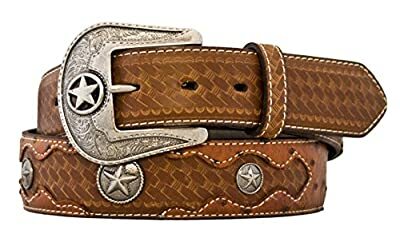 LEATHER - This belt is made from genuine full-grain leather back and man-made top layer that delivers durability and long-lasting wear. COWBOY STYLE - Features a basket weave embossment and ostrich print leather overlay with studded metal star concho. REMOVABLE BUCKLE - Removable pewter-tone buckle with star and filigree embossing. WESTERN-INSPIRED - An excellent accessory choice that will go with your Western-inspired outfit any day! PERFECT GIFT - Ideal gift for your loved ones on a special occasion to awaken their cowboy spirit!